I had my first ultrasound today. The ultrasound room felt so familiar to me, so many great moments there, but today I was scared as hell to be there. Like I thought, I was not as far along as according to my LMS. Turns out that I am 8 weeks and 4 days pregnant. 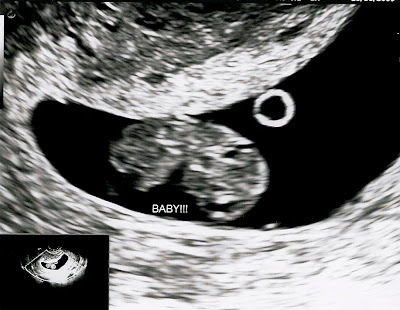 There in only one baby (thank goodness), it is adorable and looks like a little bean. Seeing the baby and hearing the heart beat made me feel so relieved! Now to the not so happy news, turns out that the baby has Tachycardia, it's heart rate was 202, which is too high. I'm so nervous, I feel as if me being sick is causing this and I feel so guilty. The doctor said that they may have me come in within the next two weeks to do another ultrasound, one where they study the heart and blood flow, or else I will have to wait 5 weeks and check it at my next appointment. I don't think I can wait 2 weeks let alone 5. I've been on such an emotional rollercoaster today, it's getting hard to handle. I will talk to the nurse tomorrow to see what will happen. If the heart rate stays above 200 that means a possible heart defect, please pray and hope for the best. *Update: I will have another ultrasound on the 26th. I love you. I hope that everything is going to be ok.